Post subject: Is This Hardwood Flooring? I'm appraising a home and the realtor says it has hardwood flooring. I'm not sure. Let me know what you think. Post subject: Re: Is This Hardwood Flooring? 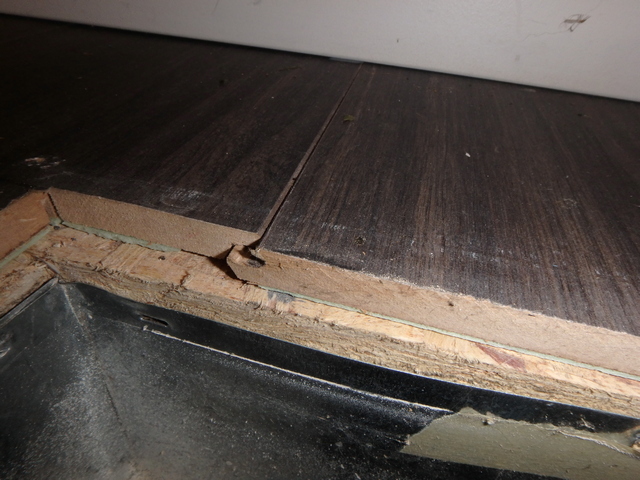 There are some so called engineered hardwood that looks like that which Lumber Liquidators sells on a HDF core with not even a 1mm veneer on top. Just saw some today. Pretty much garbage throw away floor. Might as well be a plastic laminate. It looks like laminate to me, but I suppose it could be a super cheap engineered hardwood from LL or HD. If it is, it will scratch very easily and won't last long and will need to be replaced. Often you can tell if you're not sure by scratching/feeling top (this part looks like it's under the register, so you could scratch. But, I'm guessing you aren't there any more. I would ask for receipt for flooring and get manufacturer/subline and then you can check it. Jim, it is laminate flooring.